TEPCO has decided to entomb Reactor 1, which is confirmed in a state of full meltdown, in a sarcophagus shell to contain the high amounts of radiation that escape every day. Simulations have led experts to believe that meltdown occurred after 3.5 hours after the cooling systems stopped. While TEPCO finishes the designs for its containment structure in Japan, in the Ukraine, the Chernobyl sarcophagus is also being re-encased. The installment of the cover is a temporary emergency measure, and its ability to withstand seismic activity is unknown. 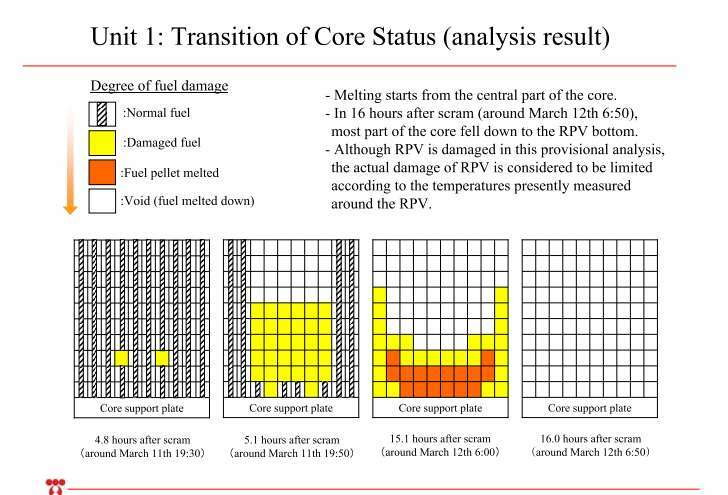 The full situation inside of Reactor 1 has not been released to the public yet, but monitoring of pressure readings inside of the RPV show that the pressure is equal to atmospheric pressure and dropping. Both Reactor 2 and Reactor 3 RPV pressure levels currently register a lower than atomospheric pressure reading. Video inside of the plant on June 3rd, provided footage of steam forced out of the reactor that registered over 4 Sieverts. 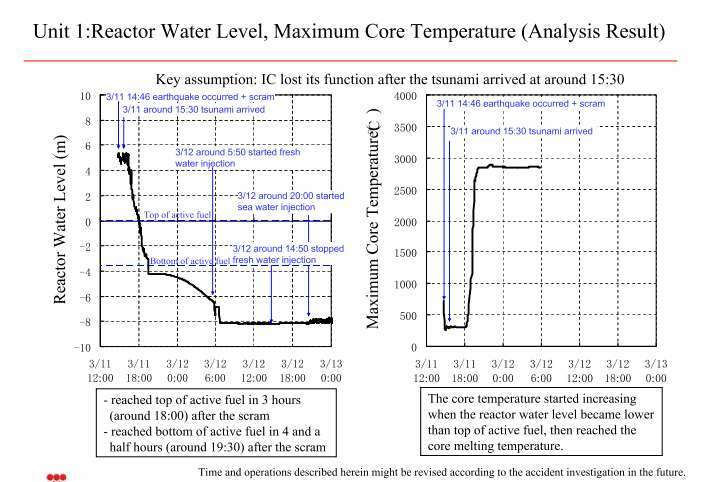 While TEPCO continues to claim the pressure levels recorded in the Containment Vessel mean that the melted core has not yet escaped all containment measures, they do admit that contaminated water continues to leak from the Containment Vessel. There is estimated to be at least one 7 centimeter hole in the CV. TEPCO has announced that they do plan to install a new pressure gauge for the CV at some point in the future, and also must replace the broken radiation detection instrument in the drywell. While the question of whether the Corium has escaped the building remains unanswered, the radiation levels inside and outside of the Reactor 1 building remain a constant enemy for workers. Beside the 4,000 mSv steam, in May readings inside of the building registered 1,000 mSv on the 2nd floor, 2,000 mSv inside the southeast double door, and it is estimated at least 3,000 tons of contaminated water had leaked into the basement by mid-May. By that point TEPCO had injected over 10,000 tons of water inside of the RPV, and the exact location of the other 7,000 tons was never produced. These are just a few of the many obstacles that face TEPCO as they attempt to keep the situation under control to be able to complete the sarcophagus construction. 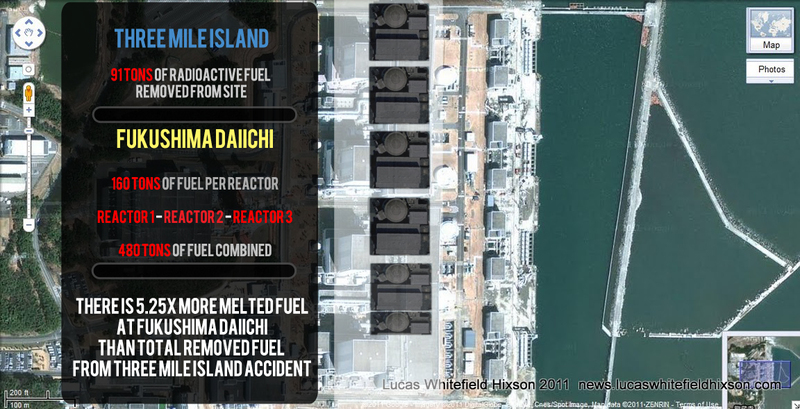 How much melted fuel is at Fukushima Daiichi? 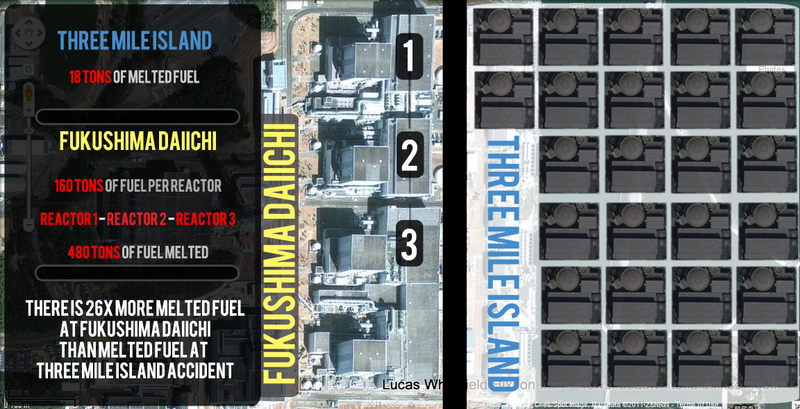 These estimates are based off of public information regarding amounts of fuel stored in Reactor 1, Reactor 2, and Reactor 3. All listed reactors are currently believed to be in a state of full-meltdown, but the actual amount of corium is likely greater than numbers used as other elements are incorporated during a meltdown. The covering structure was initially designed with a steel frame and a resin-coated polyester covering, but was redesigned with concrete walls. TEPCO has not provided what information was used to determine the ability of the ground around the sarcophagus to hold the additional weight of the structure and original reactor building. There is also no mention of what would happen if the melted corium, which thought to have escaped containment, were to cause an explosion inside of the structure. A model of the structure and cranes used to assemble it. Construction on the concrete and steel structure will begin on June 27th, according to the latest updated plans released by TEPCO. High levels of radiation will severely limit the amount of work that can be done on-site, and will also accelerate the aging of materials used for the sarcophagus. This is one of the lessons learned from the construction of the first sarcophagus at Chernobyl, and to combat the on-site radiation, TEPCO will build many parts off-site. The utility hopes to finish prefabrication of the frame and have it shipped to the site by late July. The sarcophagus that encases Reactor 4 at Chernobyl was also constructed in haste, and is currently in an desperate need of repair. The greatest problems with the Chernobyl sarcophagus is its lack of stability, which will be a even greater problem at Fukushima Daiichi. 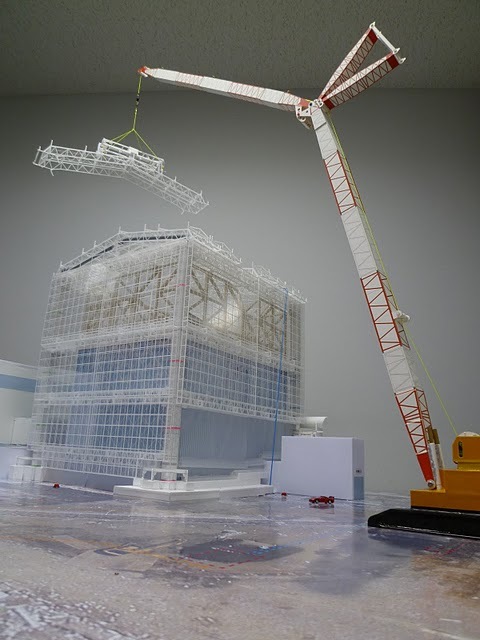 The assembly process is to be primarily accomplished by remotely controlled cranes and other automated vehicles, in order to limit the amount of radiation workers are exposed to. This is the plan at least, at Chernobyl initially robotic equipment was used to try and clear debris from the roof and around the damaged reactor, but the high levels of radiation caused all the equipment to fail. This forced the Soviet Government to send in over 500,000 bio-robots from all around the Soviet Union. The cranes to be used at Fukushima Daiichi are capable of transporting over 750 tons per load, but even the largest cranes in Japan can be rendered scrap if the wiring and electrical components are compromised by radiation. To connect the frame, TEPCO developed a new connection part to try and create a functional fitting connection to keep the workers from entering the assembling area as little as possible. If the shroud is completed, it must also be able to prevent precipitation from entering the reactors, and limit the emission of radiation from the reactors and spent fuel pools. Despite all of the best made plans, utility officials admit they are unsure of if construction can be completed, if it will perform as expected, and how long it may last. Some of the many unanswered questions are, how much radioactive waste will need to be removed prior to construction, and how will TEPCO accomplish this. If the remote-controlled equipment fails, what is the contingency plan? Similar to Fukushima, the initial Chernobyl Structure was also constructed as an emergency measure to prevent radiation from being released into the atmosphere and further contaminating the northern hemisphere. Only 200 tons of radioactive corium is locked within the structure, a fraction of the amounts estimated to be in the reactors at Fukushima Daiichi. The radioactivity inside of the sarcophagus prevented work from being completed at the time. 2. Due to harsh construction environment the structure was completed even though it had many defects and cracks that still allowed some radiation to be dispersed. 6. Europe is constructing a new dome over contaminated plant to prevent another nuclear disaster.